Gwerinwyr Gwent has a dedicated band of musicians, some of whom travel from the far side of Cardiff to play for us every week whilst we practice dances, which vary from slow, courtly dances to lively fair dances. We are always looking for new band members, so if you are interested please get in touch. We dance just for pleasure, although we take part in festivals and demonstrations both in Wales and Europe. This year we will again be performing at the Tredegar House Folk Festival and some of us will be hosting dancers from overseas. This leads to invitations to dance in their countries. In recent years we have danced in Germany, Italy, Belgium, Denmark and Finland, and in 2011 some of the team went to the Ballydehob festival in West Cork, and to Latvia. 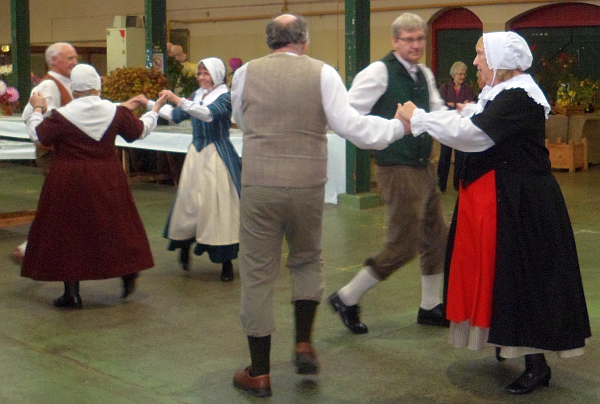 We were invited to perform at the Lowanderperan festival in Perranporth in October 2012 and enjoyed this. 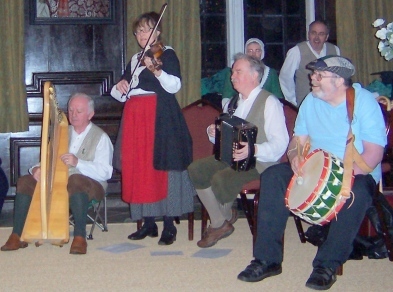 In 2014 we hope to perform some dance spots at the Oxford Folk Weekend. We are often to be seen dancing out of doors in the summer and in 2010 we danced at Magor Fayre on 3rd May, Tredegar House Folk Festival on 8/9th May and Llanover Open Garden day on 5th September. 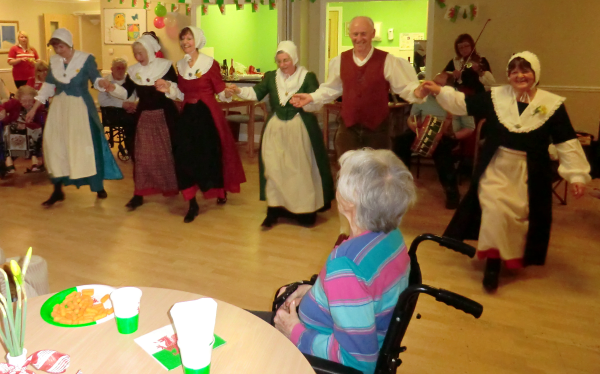 In 2011 and 2012 we again danced at Llanover House, this time earlier in the season, in March. We are well known for organising twmpaths and Noson Lawen evenings; the charges for these depends on the time involved and the distances travelled. The picture on the right shows us performing at Ty Enfys residential home in Cardiff in 2012. We are actively seeking new members and either beginners or experienced dancers are very welcome. Practice night is Thursday 8-10pm at the Graig Community Hall, Bassaleg, NP10 8LG (opposite the Ruperra Arms). Just come along, or ring 01495 271953 for more details. Dancing is fun; it’s exercise but you don’t have to be superfit to do it….give it a try!